Many visitors to the Great Wall bemoan the crowds. Let's be honest, the Great Wall is one of China's biggest attractions. Hundreds of thousands of visitors go daily. If you go to the most easily accessed sections from Beijing, yes, likely, your part of the wall will be quite crowded. There is a remedy to this, however. If you have the time and ability, getting outside of the most visited areas of the Great Wall is highly worth it. While it might take you a longer time to get to the hike starting point, have the Wall to yourself is a wonderful payoff. Some say that the hike between the sections of Jinshanling and Simatai also gives the visitor a more "authentic" Wall experience. My view is that any experience with the Wall is authentic, but if you're looking for breathtaking views in relative isolation, combined with some exercise, then this trek is definitely for you. Jinshanling is 87 miles (140 km) outside Beijing. Simatai is 75 miles (120 km) outside Beijing. 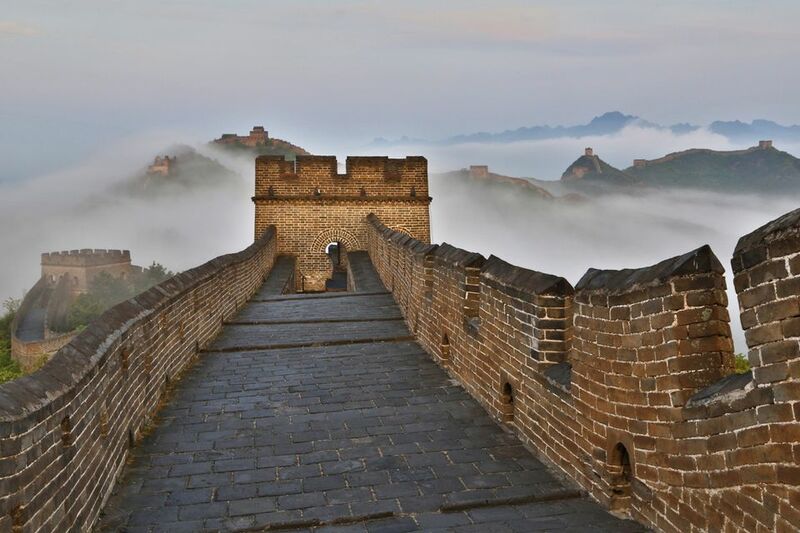 See Jinshanling and Simatai sections for histories of each part of the wall. You can certainly organize your own transportation to one of the sections. Inquire with your Beijing hotel about hiring a private car or taxi, or taking the public bus. If you're planning to do a hike between these sections, you need to plan your whole day around the trek. Leave early from Beijing, allow at least 2 hours to arrive at your start point, 4-5 hours trekking time and another 2 hours to return to Beijing. Spring and fall will offer the best views. The most comfortable time to visit is spring and fall. These two season will also give you the clearest air and good views. Summer time will be very hot and humid so you need to be very fit (and hydrated) to do a hike in this season. Winter can be beautiful with snow on the mountains but it can also be treacherous. Sturdy hiking boots or walking shoes - don't underestimate the climbing and trekking value despite the fact that you're on a paved wall. Once you get away from the more renovated parts, rocks can be loose and the steps can be quite steep. Backpack - you'll want to take a pack along for storing extra clothes and water. Sun gear - there is virtually no shade along the Wall. You'll need adequate sun protection. Trekking poles - you might even want these if you think they will make the climbs and descents easier. See step by step photos from traveler David Turner at his image gallery: Hike from Jinshanling to Simatai.